French warplanes struck a rebel convoy in northern Chad, helping local troops repel a cross border incursion from Libya, a sign France’s support for President Idriss Deby goes beyond fighting Islamist militants. Mirage jets struck a column of 40 pickups carrying armed groups from Libya into Chadian territory, the French army said in a statement. “This intervention at the request of Chadian authorities helped hinder this hostile advance and disperse the column,” it said. The strikes were the first by French jets in support of Chadian troops since the rebel Military Command Council for the Salvation of the Republic (CCMSR) in southern Libya increased its activities last year in a bid to overthrow Deby. The Union of Forces of Resistance (UFR), a rebel Chadian coalition created in 2009 after almost toppling Deby, was behind the offensive. CCMSR is a splinter group of the UFR. The official said two fighters were killed and two trucks destroyed. Deby faced several rebellions since seizing power in 1990 in a military coup. International observers questioned the fairness of elections that have kept him in office since. Last year he pushed through constitutional reforms that could keep him on office until 2033. France considers its former colony vital in the fight against Islamist militants in West Africa and based its 4,500-strong counter-terrorism Operation Barkhane force in N’djamena where the United States also has a base. 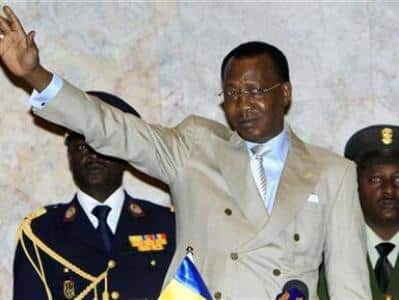 Deby’s fight against Islamist militants – he deployed troops to counter groups linked to al Qaeda and Islamic State in the Sahel and Lake Chad region- strained his military and hit the oil-dependent economy, leading to growing dissatisfaction in one of the world’s poorest nations. “Deby remains the most viable and solid partner in the region. The Chadians are counting on France for the Libyan border,” a French military source said. Chad’s military command said the operation neutralised the column of “mercenaries and terrorists” in Chadian territory after earlier operations by the Libyan National Army. The LNA, the military wing of one of Libya’s two rival governments operating in the east of the country under General Khalifa Haftar, began operations against Chadian rebels at the start of the year. Haftar has close ties with France which backs him against Islamist militants in Libya.